I’m an everyday person who happens to have a blog. I’m not a journalist or media critic but what I try to do with my blog is expose hypocrisy in politics, and open people’s eyes to a point of view that they may not have seen on their own. I’m an African American liberal democrat born and raised in North Carolina and everything I write about comes from personal experiences colored by the aforementioned pieces of what makes me who I am. So for those who accuse me of only writing about race, lgbt issues, or democratic politics, I say to them, of course. I’d be a fool to write about things I know nothing about. Any writer would. I can write about racism because I’ve experienced racism. I can write about being gay because I am gay. I can write about liberal democratic politics because I am a liberal democrat. It’s just that simple. What I’m about to share with you in this particular blog post is something I’ve been writing in my head for the past few months. It’s about race and racism and how it influences every aspect of American life. For those of you who strongly disagree with this assertion, I ask that read this entire piece before forming opinions on it’s validity. Ever since the brutal slaying of unarmed teenager Trayvon Martin by George Zimmerman, the incident seemed to expose an unspoken truth among a lot of white Americans (both liberal and conservative). The fear of violence at the hands of African American males. I had no idea how pervasive this fear was until this case. After Trayvon’s death the district attorney in Sanford Florida refused to bring charges against Zimmerman. Trayvon’s parents pleaded with the district attorney for months to take action to no avail. Then civil rights leaders like Rev Al Sharpton and other civil rights groups got involved to put pressure on Sanford’s district attorney to charge Zimmerman and let a jury of his peers decide his fate. What a lot of conservatives fail to realize is the only reason outside help was needed was because the D.A. wouldn’t bring charges. Not because a white person killed a black person. This point was lost on Fox News as well. In response to the involvement of civil rights groups, Fox News began searching for murders that were committed by blacks with white victims. They asked their viewers why didn’t Sharpton and the NAACP get involved with those cases. The answer to that question is very simple but no one on that network had the intelligence to come up with it. In all the cases they reported with a black person killing a white person, the black defendant was arrested and charged right away. Trayvon’s parents and Al Sharpton were only asking for a day in court. The injustice was never about a white person killing a black person. The injustice was an adult stalking and murdering an unarmed teenager then claiming self defense and walking away without having to prove it was self defense in a court of law in front of a jury of his peers. So for those who say liberal media and civil rights groups ignore crimes committed by black people against white people you are trying to draw comparisons and conclusions to circumstances that are completely different to fit a racial bias that you already believed existed. It’s called intellectual dishonesty. American news papers within the last century knows how ludicrous this assertion is, but that’s not even the most disturbing untruth that came out of Mr O’Riley’s segment. O’Riley and everyone on his panel all agreed that the “black community” has a problem with violence, unwed child birth, work ethic, and government hand outs. All of these things were accepted as fact by everyone. First of all I take issue with anyone who thinks race can be associated with a propensity to commit crime, or is somehow associated with loose morals. And I take an even bigger issue with those who use the term “the black community” to imply that every black person thinks, acts, feels, and behaves in unison. THERE IS NO BLACK COMMUNITY… especially in the context that they were using it in. 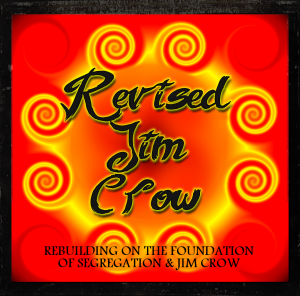 People seem to forget that Jim Crow and racial segregation only ended 50 years ago. Blacks were thought to be inferior to whites. We weren’t allowed to vote. We couldn’t look white people in the eye. We had no right to education. There were curfews in southern cities for blacks. We couldn’t attend certain colleges. The types of jobs we could apply for were extremely limited. Blacks could get lynched for almost no reason at all. The KKK committed atrocities and murders without the fear of arrest. All of this happened not too long ago. My mom and dad were alive and witnessed the horrors of the segregated south. Now that Jim Crow is gone and there are laws in place that brought an end to segregation things are a lot better for blacks. But laws can’t change the mentality that made Jim Crow possible. That mentality is still alive and well. Bill O’Riley’s segment proves how ingrained those beliefs are. Think of racism and racial stereotypes as a building. The Jim Crow laws and segregation were put in place because whites believed blacks were violent, intellectually inferior, lacking morals, shiftless, and incapable of living without strict rules and oversight by whites. So Jim Crow and segregation are the walls of our building. The foundation that supported those walls are the beliefs of inferiority and a propensity for violence. The iron beams that allow this building to stand up and add floor after floor are the political figures and groups who help spread the message. The Bull Connor’s, the George Wallace’s and the KKK for example. Out of the civil rights movement we got legislation like The Voting Rights Act, and The Civil Rights Act which killed Jim Crow and ended segregation. That was the wrecking ball that knocked the walls of this building down. Blacks were finally equal in the eyes of the law. We got the right to vote, we could attend any college we wanted, schools were desegregated, employers could no longer exclude people based on race. All of this improved the lives of many many oppressed blacks that were suffering in the south. But legislation only destroyed the walls. The foundation that supported the walls were still left because you can not legislate peoples beliefs. You can’t erase a century’s worth of propaganda that convinced white America that blacks were violent and inferior just by passing a few laws. Even the most liberal democrat can fall victim to this ingrained racial way of thinking. Most people think stereotypes have foundations in truth. Everyone in this county is aware of racial stereotypes. Blacks are violent, uneducated, lazy, more than likely on government assistance, possesses low morality, etc. Everyone knows those stereotypes. If I’m a person who believes that most stereotypes contains a little truth, my mind becomes open and more aware of situations that either reaffirms or confirms those stereotypical qualities. If I’m watching the news and they show five reports of violence and one out of the five reports involve a black perpetrator I’m going to notice the one report with the black guy. And everything that seems to confirm this stereotype I now believe is true will strengthen my belief about blacks and violence. Normally I would say who cares what some random guy things about people who share my skin color. But here is why I should care and why you should care. We pass quick judgments about the people we meet everyday. Sometimes we get a gut feeling about a person and we’re not even sure where it comes from. Take that same guy who has witnessed a reaffirmation of the stereotype that blacks are violent. Lets say he’s the manager of a daycare. There’s a black applicant and a white applicant. Both are equally qualified for the position. The manager believes a reinforced stereotype that tells him the black applicant is more likely to cause problems so he hires the white applicant. In his mind he’s doing the right thing for his daycare. He’s protecting the children. The man in this scenario isn’t necessarily racist. He’s a victim in this situation as well. When he watches Fox News he’s expecting news. He’s expecting to be told the truth. Instead he gets garbage dressed up as news. And Fox isn’t the only media outlet that stokes the racial fears and stereotypes harbored by well meaning white America, but they are the biggest peddler of this kind of thing. Before President Obama took office it seemed like there was a steady decline in racial bias in media. But when he won his first term in office conservative media saw how easy it was to reignite the racial fears of white America for political and economic gain. How many times have you heard the term “reverse racism” before Barack Obama became president? For the past 5 or 6 years Fox, the Tea Party, republican extremist, evangelicals, and conservative media have quietly began building on the foundation that allowed Jim Crow and segregation to exist. Fox commentators are constantly talking about crime in the black community. Every shooting in intercity Chicago gets that headline. When crime occurs in a white neighborhood there’s never any headlines that say “crime in the white community”. There’s been numerous shootings and mass murders at schools all across America. All the perpetrators have been white. Never once did anyone describe these shootings as a problem in white America. Another favorite buzz word or news headline within conservative media is “black on black crime”. They talk about it as if it’s a sui generis phenomena that exist exclusively among blacks. It’s true that most crimes committed by someone black is perpetrated against a black victim. But that’s true about ALL races. 86% of crimes committed by white people are perpetrated against a white victim. But for some reason no one has ever uttered the words “white on white crime”. All of these things effect equality. 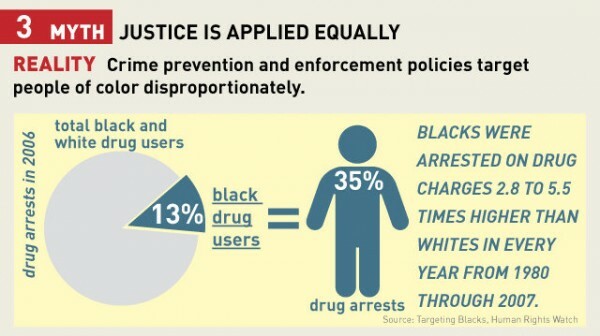 Judges give black defendants longer sentences, police stop and arrest more black’s than any other race, blacks get paid an average of 20% less than whites with identical qualifications and job duties, banks are less likely to approve loans for blacks than whites, etc etc. Brick by brick the building built upon the foundation of racism and racial stereotypes gets taller, stronger, and a lot more visible. The Supreme court striking down the voting rights act, Stop and Frisk, voter id laws, stand your ground laws, are all issues leading America toward a new variation of our dark twisted past. 1. The “Black Community” does not exist in the way that Fox News and other media outlets and personalities use it. They use it to imply that all black people think alike, have the same beliefs, behave similarly, and can be dealt with as a group. Just because I share a skin color with some gang member in LA does not mean we have anything in common, and certainly does not mean that I or any other black person shares any responsibility for any crimes or gang activity that this gang member becomes involved in. 2. No matter what crime statistics say, lawmakers and police can not use them to justify increased scrutiny on a whole race of people. Anyone who believes otherwise are basically saying that they believe race can determine behavior. This belief comes straight from the foundation that Jim Crow and segregation was built on. 3. Anyone who can’t admit that a majority of conservative media likes to reinforce negative racial stereotypes is being intellectually dishonest with themselves. 4. Racial language is a very small symptom of a much larger illness. If we want every person that gets caught saying something racist to be pulled off TV and vilified in the press, we’ve only suppressed that symptom temporarily. Instead we should attack the set of circumstances that created the illness. How else can you challenge a racial stereotype if we’re never allowed to have that conversation?